The Wireshark dissection engine could crash. The DCOM dissector could crash. The LBMPDM dissector could crash. The MMSE dissector could go into an infinite loop. The IxVeriWave file parser could crash. The PVFS dissector could crash. The ZigBee ZCL dissector could crash. VoIP Calls dialog doesn’t include RTP stream when preparing a filter. Closing Enabled Protocols dialog crashes wireshark. Unable to Export Objects → HTTP after sorting columns. DNS Response to NS query shows as malformed packet. Encrypted Alerts corresponds to a wrong selection in the packet bytes pane. ESP will not decode since 2.6.2 – works fine in 2.4.6 or 2.4.8. Wireshark tries to decode EAP-SIM Pseudonym Identity. Infinite read loop when extcap exits with error and error message. OPC UA Max nesting depth exceeded for valid packet. TShark 2.6 does not print GeoIP information. ISUP (ANSI) packets malformed in WS versions later than 2.4.8. Handover candidate enquire message not decoded. TShark piping output in a cmd or PowerShell prompt stops working when GeoIP is enabled. ICMPv6 with routing header incorrectly placed. IEEE 802.11 Vendor Specific fixed fields display as malformed packets. text2pcap -4 and -6 option should require -i as well. text2pcap direction sensitivity does not affect dummy ethernet addresses. MLE security suite display incorrect. Message for incorrect IPv4 option lengths is incorrect. TACACS+ dissector does not properly reassemble large accounting messages. NLRI of S-PMSI A-D BGP route not being displayed. 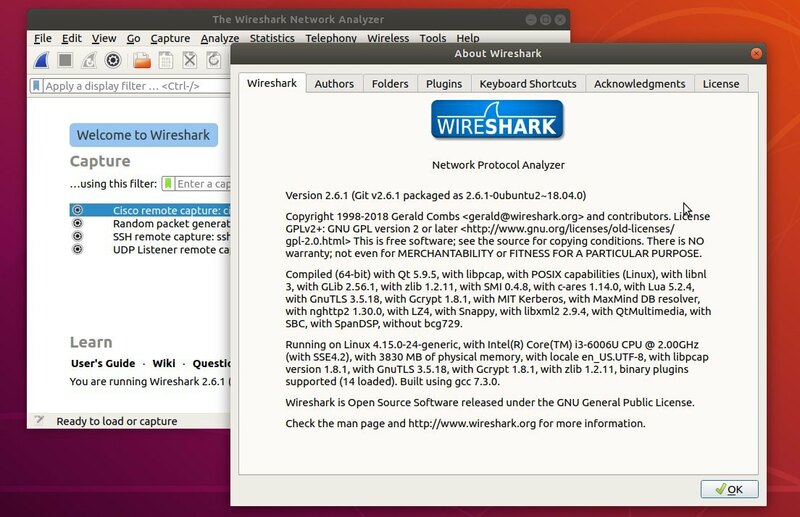 Balint Reczey maintains the Wireshark packages for Ubuntu. The new 2.6.5 package will be published in Ubuntu universe repository. 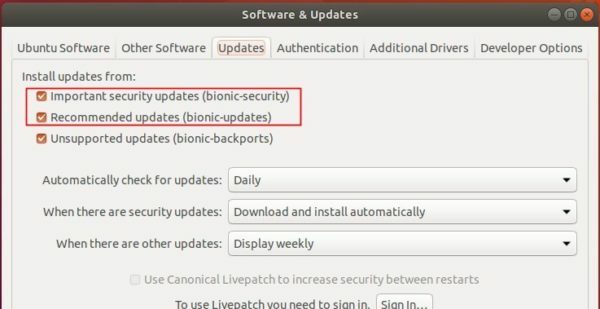 Make sure the security and updates repositories are enabled in Software & Updates -> Updates. 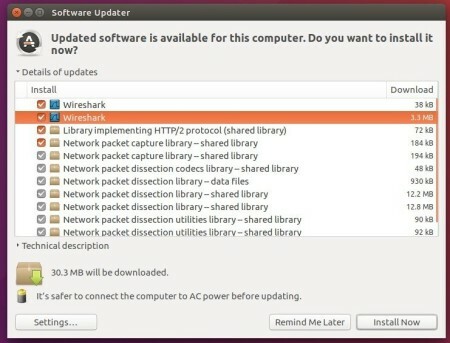 Once the new release package is published, you’ll receive Wireshark updates through Software Updater. The open-source network packet analyzer Wireshark 2.6.3 was released a few days ago with various bug-fixes and updated protocol support. ISDN – LAPD dissector broken since version 2.5.0. TLS records in a HTTP tunnel are displayed as “Encrypted Handshake Message”. Heartbeat message “Info” displayed without comma separator. Bug 15079. As the PPA packages are always a few days late than the release date, check the PPA link before getting started. 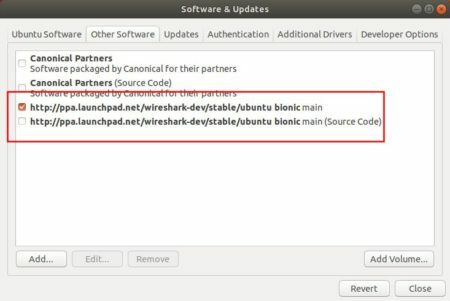 Wireshark stable PPA contains most recent packages for Ubuntu 18.04, Ubuntu 16.04, and Ubuntu 14.04. Type your user password (no asterisks feedback due to security reason) when it prompts and hit Enter. And remove the PPA by launching Software & Updates -> Other Software tab. Wireshark network packet analyzer 2.6 stable series now is available to install in all current Ubuntu releases via the stable PPA. Support for MaxMind DB files. Support for GeoIP and GeoLite Legacy databases has been removed. The Windows packages are now built using Microsoft Visual Studio 2017. The IP map feature (the “Map” button in the “Endpoints” dialog) has been removed. So far the PPA contains Wireshark 2.6.1 for Ubuntu 18.04, Ubuntu 17.10, Ubuntu 16.04, Ubuntu 14.04. Wireshark network analyzer reached 2.4.5 release a few days ago. Lots of vulnerabilities and bugs has been fixed in the release. The IEEE 802.11 dissector could crash. Multiple dissectors could go into large infinite loops. The UMTS MAC dissector could crash. The DOCSIS dissector could crash. The FCP dissector could crash. The SIGCOMP dissector could crash. The pcapng file parser could crash. The IPMI dissector could crash. The NBAP disssector could crash. Unable to create Filter Expression Button for a yellow filter. Other fixes and updated protocol support. See release note. 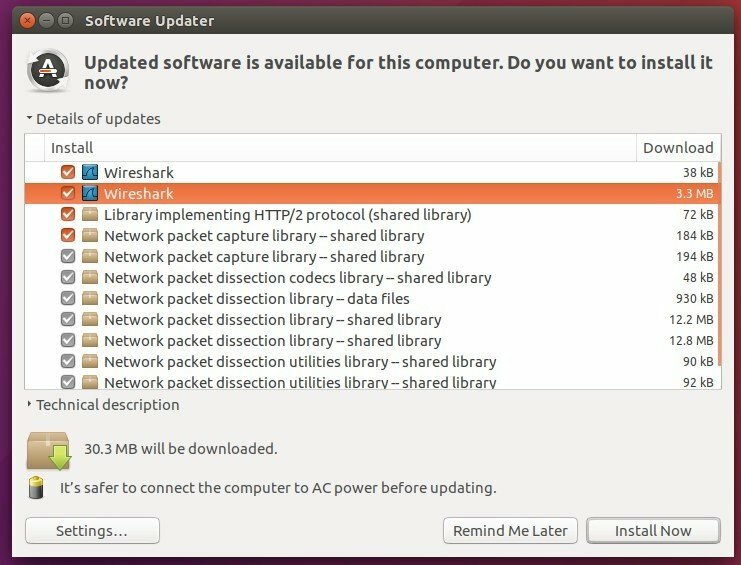 Wireshark has a stable PPA with the latest packages for Ubuntu 14.04, Ubuntu 16.04, and Ubuntu 17.10. You may first check the PPA link for package version before doing following steps. Type in your password (no visual feedback due to security reason) when it asks and hit Enter. Wireshark network analyzer 2.4.4 was released a week ago. Now it’s finally available in PPA repository for Ubuntu 14.04, Ubuntu 16.04, Ubuntu 17.10. The WCP dissector could crash. Disabled the Linux kernel’s BPF JIT compiler due to security vulnerable. Remote interfaces are not saved. Wireshark & Tshark 2.4.2 core dumps with segmentation fault. SSH remote capture promiscuous mode. For more, see the release note.